"Yes... I am still breathing." "NO, I haven't been abducted by aliens... and I don't know where your cows are!" "I didn't trip on the carpet, hit my head and am now suffering from amnesia." "YES, My fingers are all intact and NO even if they weren't my nose is not pointy enough to type." Having come back from my early summer western MC ride on the Savage, cutting what amounted to a hayfield for a lawn, getting rained out in New Brunswick on our annual off Island ride, and dealing with what appears to me are hundreds of minor issues... I simply have not had much time. Just the other day, while riding my long time friend, Big Blue, the XT 600... I got to thinking. I'd bought that bike to take then sweetie Deb and our other XT 600 for a winter ride to Baja California. We spent nearly 2 months on the road and rolled on over 6000kms. Things seemed so simple then. 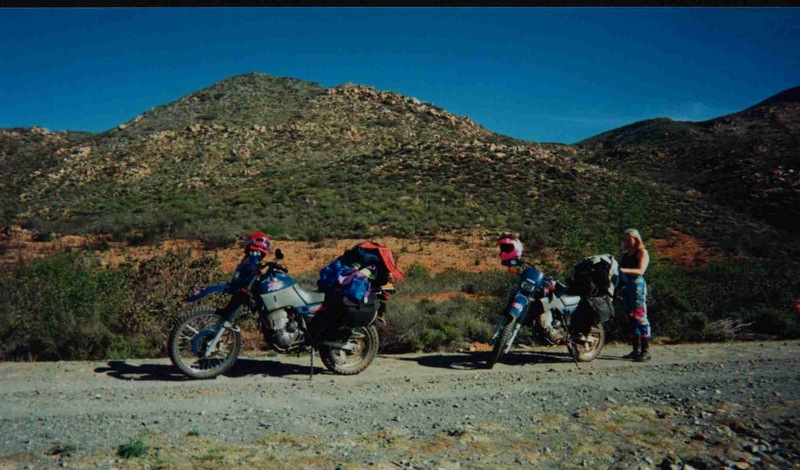 We lived out of our saddlebags, stayed in cheap Mexican hotels and had several 'box' camera's for pics. I'm answering emails (I'm behind on those too) one of which is to my old buddy Ron, and I say's to Ronnie... I have a video camera to my right, a bike mounted video camera to my left, three other cameras within reach, a TV, several remotes, two phones (including one that is still smarterthanIam) , a pile of unread mail, a Tom Tom, several battery chargers, and in the garage on the other side of my study wall, there are cars and motorbikes, some of which need tires changed, the odd battery, a washing etc etc. Meaning I haven't had a paycheck in several years, but not meaning I have time on my hands. After moving here and getting re-acquainted with old friends, one of the most frequent questions was, "do I want to work on other people's bikes?" Nothing real technical, just something to keep me busy. Ha! There are plenty of times I wish my brains and hands were doing nothing what-so-ever. "NO, I haven't been abducted by aliens." ...and "NO, I have not seen your missing cows."